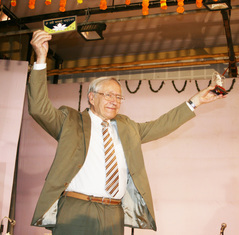 Dr. T. D. Singh Memorial Lecture on Science and Spirituality by Nobel Laureate in Chemistry, Prof. Richard Ernst, Jan 5, 2012, Utkal University, Orissa. Conference on Science, Spirituality and Human Values in the 21st Century, March 25, 2012, Niser, Bhubaneswar, Orissa. Seminar on Science and Spirituality, March 31, 2012, College of Agriculture, Sambalpur, Orissa. 'Inspiring Billion Minds' Lecture Series at more than 20 premier institutions in western and northern India from Jaipur to Kalka to Kurushetra - including lectures at NIT Jaipur and NIT Kurushetra, April 5-28, 2012. Seminar on 'Search for God in the Age of Science and Technology', April 22, 2012, Delhi Technological University (DTU), Delhi. A Short Course on Science and Spirituality, May 18-20, 2012, Navadvip, W.B. Special Lecture on Thermodynamics of Life, July 23, 2012, IISc, Bangalore, by Prof. S. C. Mishra, IIT Guwahati. Lecture on 'Vaisnava Vedanta', Rupa Goswami Conference on Vaishnavism, July 30-Aug 1, 2012, Gopinath Bhavan, Vrindavan, U.P. Lecture on 'God's Mechanics', August 3, 2012, Institute of Energy Management and Research (IEMR), Gurgoan, Haryana. Conference on Symbiosis of Science and Spirituality for Holistic Growth, August 9, 2012, National Dairy Research Institute (NDRI), Karnal, Haryana. Seminar on Science and Spiritual Quest, August 14, 2012, Science College, Osmania University, Hyderabad. 7th All India Students' Conference on Science and Spiritual Quest, IISc Bangalore, Sept. 1-2, 2012. Invited Lectures at 'Science and Spirituality in the Age of Technology' Conference, University of Mumbai, Mumbai, Oct. 5-6, 2012.